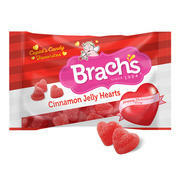 Brach's cinnamon hearts are a favorite Valentine Candy. If you are a cinnamon lover these are very hard to resist. These are one of those Valentine candies that have been around forever and are a must have for many year after year. If you have never tried this I suggest you do. You get a soft jelly heart shape candy with a cinnamon flavor then covered in sugar. You get a spicy and sweet taste all in one bite. These hearts have just the right amount of cinnamon, nothing over bearing. Not only are these fun to just eat out of the bag or to put in your candy dish, but they are also perfect for your Valentine treats. Buy your Brach's cinnamon hearts today, as these are strictly a Valentine Candy, once they are sold out for the year they are gone until next Valentine's day.